With more than 15,000 taxa from such far-away places as Morocco, Kazakhstan, South Africa and the Himalayas, Denver Botanic Gardens is recognized as one of the top five botanical gardens in the United States. There's something for all ages -- and all five of your senses. Explore 24 acres of fragrance and foliage any time of the year at our beautiful facility at 1005 York Street. Additional sites at Denver Botanic Gardens Chatfield Farms, a 750-acre wildlife and native plant refuge in Littleton; and Mt. Goliath, a high altitude trail and interpretive site on the Mt. Evans Scenic Byway, extend this experience throughout the Front Range. The Research & Conservation Department at the gardens plays a critical role in the conservation, preservation, and documentation of native Colorado flora by serving as an active center of biodiversity research. Mycological herbarium: > 14,000 specimens. Special Collections:7 major collections in the following areas: Native, Alpine, Steppe, Cactus & Succulents, Tropical, Aquatic and Amenity. Denver Botanic Gardens is committed to plant research and conservation and has active programs related to ex situ and in situ conservation and monitoring of rare plants, biodiversity surveys of regional flora, restoration, phenology, conservation genetics, phylogenetics, and taxonomy. One of the gardens sites, Chatfield Farms, is a 700 acre property 15 miles south of the Denver metro area (and the gardens urban campus) which has been intensively managed since the mid-1800s. Today, Chatfield is a mosaic of plant communities that can be divided into three broad categories: agricultural pasture, grasslands, and riparian plant communities. 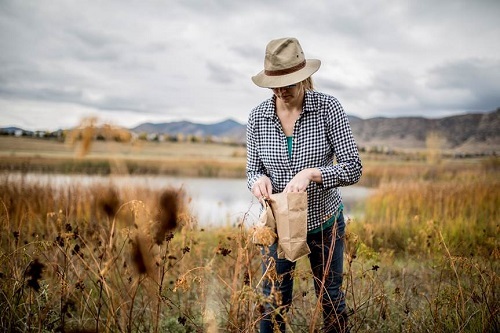 The mission of Chatfield Farms is to inspire the public to be good stewards of the environment by connecting people to our past, present and future relationships with native plants of the Rocky Mountain Region. One of the initiatives laid out in the master plan for Chatfield Farms is to offer publicly accessible examples of prairie and riparian restoration. While we have long-term plans to restore prairie habitat, we are currently working to restore 5.5 acres of degraded riparian habitat along Deer Creek, which not only serves as a heavily used wildlife corridor but is also the area most used by visitors. A graduate research assistant collects seeds of native plants at Chatfield Farms to be used in restoration efforts. This reach of creek has been impacted by past agricultural practices and by recent urbanization of the watershed. During the early twentieth century the creek was channelized to provide more efficient use of the land for farming. Spoil piles from excavating the new channel were discarded in the floodplain. Toward the end of the twentieth century and into this century, residential and commercial development in the watershed has modified the hydrology with increased volume and intensity of runoff to the creek. This channelization forces most of the increased runoff to stay in the channel generating bed scour which creates an even deeper channel. Denver Botanic Garden Chatfield Farms restoration project includes the installation of small channel structures that function like beaver dams to facilitate overbank flows to move water from the stream channel and distribute it across the floodplain, which will restore the hydrologic conditions suitable for the regeneration of cottonwoods and willows. This will, in turn, encourage more beaver activity in the reach over the long-term by increasing food availability. The end result is a more diverse flood plain habitat and habitat for fish and macroinvertebrates. The aquatic habitat is currently degraded due to high flow energies in the creek. Restoration efforts will reduce flow energies in the creek and greatly reduce the potential for erosion in the channel. This will provide the opportunity to create floodplain habitat without excavation to recreate oxbow areas. The oxbow wetlands would be connected to the creek to provide additional refugia habitat. The newly created riparian areas will be planted with a variety of native vegetation, mostly locally-sourced willows and cottonwoods. So far over 1150 native willows and cottonwoods have been planted in a 2.2 ha area and weed removal is ongoing. Other elements of the restoration plan include a hands on restoration opportunity for metro area youth, protecting desirable trees from beaver (tree painting), removing Siberian elms, Russian olives and other noxious weeds, long-term vegetation monitoring, and public education through botanical illustration, a demonstration garden and an interpretive trail. A key objective of this project is to use the riparian demonstration garden and interpretive trail to educate the c.150 000 visitors that come to Chatfield Farms annually, mostly from nearby urban areas, about the need for restoration work to protect waterways. Please contact Rebecca Hufft for more information about this project. 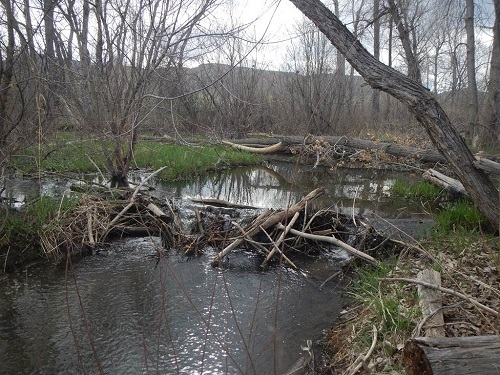 Beavers have helped improve riparian habitat at Chatfield Farms by reducing the impacts of previous creek channelization.